Rapidly reduce Acne Breakouts naturally while drastically Lessening Redness and Inflammation with Resveratrol, Glycolic Acid, Niacinamide, Aloe and Chamomile. PLUS get a Jar of our Acne Scar Fading Cream. This is the ULTIMATE in treating acne and scars. Why is Resveratrol Better than Benzoyl Peroxide for Treating Acne? It kills the acne causing bacteria equally as well as Benzoyl Peroxide, but without the horrible side effects of Benzoyl. Plus, Resveratrol is a world renowned anti oxidant with tremendous anti aging benefits. So, the Dermagist Acne Treatment system beats the acne bacteria, calms and soothes the skin, PLUS has tremendous anti aging benefits. The primary ingredient that the Dermagist Acne Treatment System uses to kill bacteria that causes acne is Resveratrol. 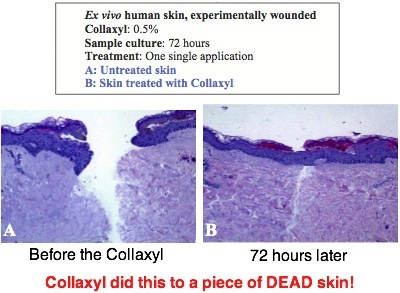 In an amazing breakthrough, Oxford University released a study that clearly showed this all natural ingredient kills acne-causing bacteria just as effectively as Benzoyl Peroxide. »Benzoyl Peroxide causes free radicals in the skin. That is the same cancer causing effect of staying in the sun Unprotected. »Benzoyl Peroxide (because of the free radicals) slows down the healing process. This means that while the bacteria might be dead, your skin's ability to calm redness and heal the sores is slowed way down, forcing you to endure more time with red, irritated skin. » Benzoyl Peroxide is known to over-dry skin, which leads to flaking and the increased chance that you will develop acne scars. » Benzoyl Peroxide can increase inflammation, making redness and brusing look worse, and last longer on the skin. How else does the Dermagist Acne Treatment System kill bacteria and breakouts? Glycolic acid exfoliates the skin getting rid of the old dead layers, and removing bacteria. Also, it encourages new, fresh skin cell growth that improves the overall health and look of the skin. It is gentle, all natural, and very effective. Tangerine oil is another ingredient infused into this magical acne fighting formula that eliminates bacteria and aids with exfoliation and generation of new skin cells. Niacinimide and Sodium Ascorbyl Phosphate are also in this formula. These are all natural ingredients that quickly kick into effect, lessening the acne breakouts, as well as preventing future ones. They make you have less pimples, and make the ones you DO get go away much faster. Calming and soothing acne prone skin is just as important as preventing the breakouts. Most acne treatments focus only on killing the bacteria, leaving the patient to endure continued the discomfort of red, inflamed skin that looks bad and can be painful. 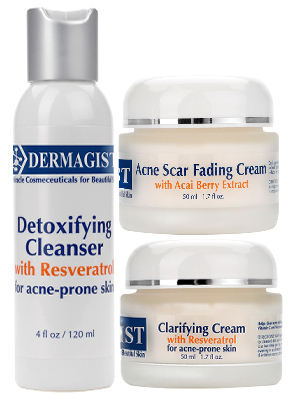 The Dermagist Acne Treatment System uses serious scientific ingredients to make your skin look better, faster. Resveratrol, which kills the bacteria is also a TREMENDOUS antioxidant and anti inflammatory. So, your skin is already one step ahead as far as redness and discoloration, simply from the antibacterial aspect of the treatment. Addtionally, Chamomile, Aloe Vera and Shea butter envelope the skin with their calming and soothing properties. These ingredients were carefully selected because they are capable of speedign the healing of the skin, and calming down the redness of the acne breakout, BUT MOST IMPORTANTLY, they accomplish this without clogging pores, or adding oil to the skin. This means that the soothing aspect of the acne treatment does nothing to "undo" any of the benefits of the other acne fighting ingredients in the treatment. 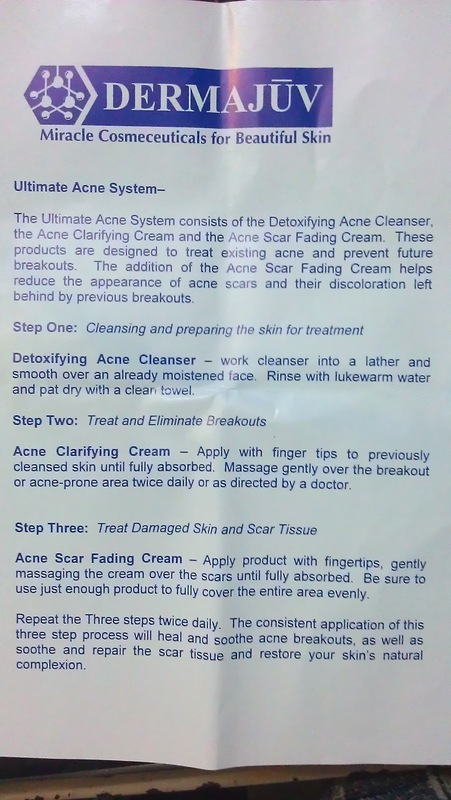 That's the info on the Acne Treatment products, now lets look into the Acne Scar Fading Product you also get!